Reading one book a day for 80 days can unlock 'a reservoir of the triumph of ideas' that is also relevant to modern brand-builders, Giles Hedger argues. A few weeks ago, in Campaign, I railed long-windedly against our disrespect for the wisdom and inspiration of the past. I wrote long, pompous sentences about the fact that the internet represents just 20 years of our four millennia of written thought, and despaired portentously at the fact that the "internet age" is too often synonymous with the "beginning of time". I referred to the creation of a "generation gap in our collective epistemology" and tilted at the windmills of progress by suggesting that we are witnessing a "widespread denial of history". Now it is payback time. To back up my wild assertions, I have decided to read one book a day for 80 days, extract from each book an idea and relate that idea to 21st-century brand-building. I made this bet with myself one day when I walked into Waterstones and saw that Penguin had launched an eclectic anniversary set of 80 invitingly Little Black Classics. All of them predate the internet – some of them by 1,000 years. First up is a quartet of bawdy tales of pimps, cuckolds, lovers and clever women from The Decameron, the 14th-century Florentine masterpiece. 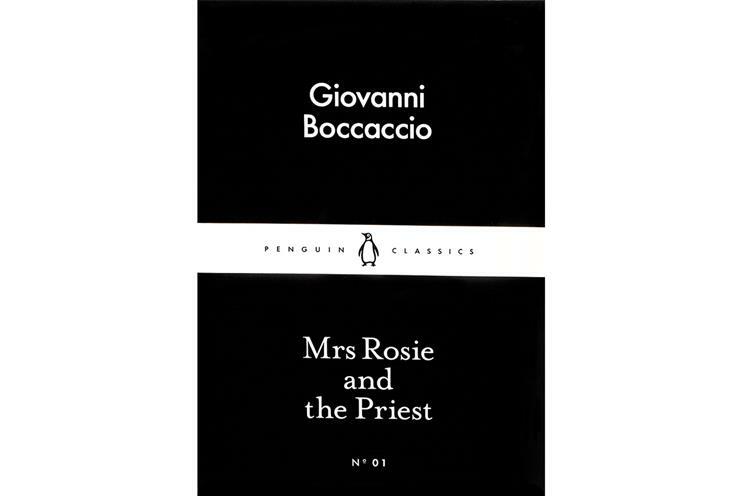 The selection is disarmingly entitled Mrs Rosie And The Priest. So, what can brand-builders learn from the saucy enterprise that connects a married woman "with lots of grinding potential" and a village priest? What golden thread can possibly be traced between medieval Italy and our beach-ready metropolis of 2015? Well, The Decameron is a masterclass in narrative framing, which is one of the things that separates storytelling from just telling stories. Florence is in the grip of the Black Death and ten young, loose-tongued refugees have taken convivial shelter in a deserted country villa. So begins the pre-Renaissance equivalent of a long weekend in Wiltshire. The device that holds the party together is storytelling, and the guests take it in turns to share a tale. Ten guests, ten days, ten themes: 100 stories, all unfolded in a perfect 14th-century "communications plan" to ensure the disbelief we suspend weighs less in our conscious mind than the acquired integrity of the stories. If we find ourselves accepting these stories as authentic, it’s because they have social legitimacy; because there is no visible motive for manipulation; and because they accurately describe the issues of the day (timelessly, the lust of the clergy, the vicissitudes of business travel and the friction between old money and new). We all owe lots to the framing techniques of Boccaccio. We create social legitimacy for a brand’s ideas by publishing them through the voices of others; we smooth the marketing motive by separating a brand from its output; and we adopt the idiom of prevailing culture to ensure topicality. We are Decameronesque. The carefully crafted hearsay of The Decameron has an effect not unlike the referred authority of social media, and it may just be that the art of "discovered content" is 650 years older than the internet. Much of the change in marketing over the past decade boils down to a change in genre. Marketers should be masters of their genre and, if your genre is storytelling, you should read The Decameron –teasing glimpses of secular medievalism that will feed your appetite for fiction while actually improving your craft.